(CNN) - Maurice Sendak, author of the classic children's book "Where the Wild Things Are," has died, a spokeswoman for Harper Collins Publishers said Tuesday. He was 83. 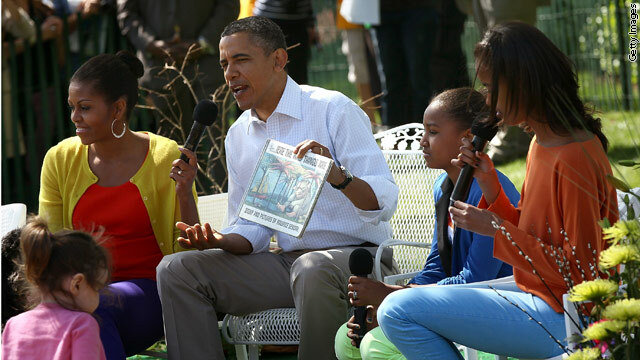 The president and his family read the famous book to a group of kids at this year's Easter Egg Roll on the South Lawn. RIP – you touched many people in a positive way. He would choose a book with only 10 sentences! Obama happened to have read the book earlier and now that the author passes away you think it's news? Why don't you dig into the budget or report on something that affects all citizens? This is a 100% fluff piece. naturally like your web-site however you need to test the spelling on several of your posts. Several of them are rife with spelling issues and I to find it very bothersome to inform the truth on the other hand I'll certainly come again again. yes, interesting posting in the political section....Mr Sendak was a gay man, perhaps an effort to bring in a few gay voters to obama...I don't know. Much more to this man than his loose association to the obamas...kind of disgusting. You folk are the worst! Are you so hateful that you can't even appreciate the fact that the Obamas so happened to have read Sendaks book at the Easter Egg Roll?? Do you mean to tell us that you can't even accept the fact that even without knowing, it seemed to be a 'timely' selection?? A timely jesture?? Maurice Sendak was a great author and what I've read and heard a great American!! Are you jealous, evil SOBs so beligerent that you can't even give him his 'props', and Obama the forethoughtfulness for even reading it, without the knowledge?? What in the world is wrong with you kooks other than what I've always known, and you continue to deny!! You are some of the worst cases of Americans!! I really am ashamed of you!! People all over the world are reading your perpetual, denigrating crap!! @Jerry, so what?? Are you that homophobic to have to denounce the decedants lifestyle??? ; if it is true, it was his life; his choice!!! You claimed you are 'military'!! Would you have made that comment after the death of one of your buddies!! You folk are the worst!! Pathetic!! Liz, I disagree with many of the comments here. @John, I didn't say a word that was negative about Breightbart when he died! However, Brietbart did a lot of harm to people with his nasty postings of lies! If any Libs did say anything about him, it couldn't have been anything other than something like, 'God doesn't like ugly'! Which is true!! Sendak was a great author, and I don't know of anyone he intentionally tried to hurt in his lifetime! He brought us happiness, love and brought us back to innocense and childhood pleasures. For you to try to make that comparison to Brietbarts death is ridiculous!! You are slipping John!! You need to give it up!! You act so childish sometimes!! As far as us having it both ways, when does that ever happen? The cons won't let us have it just one way!! It's NO WAY but the HIGHWAY, if it's not their WAY!! And that's been with EVERYTHING!! I don't even know how I finished up right here, however I thought this submit was good. I don't recognize who you are but certainly you are going to a well-known blogger if you happen to aren't already. Cheers! I'm extremely inspired together with your writing abilities and also with the structure in your weblog. Is that this a paid subject matter or did you modify it yourself? Either way stay up the excellent quality writing, it's uncommon to see a great blog like this one these days..
Nice story followed by a bunch of baboons. Fantastic points altogether, you just received a new reader. What would you suggest about your put up that you simply made a few days ago? Any positive? I will immediately grab your rss feed as I can't in finding your email subscription hyperlink or e-newsletter service. Do you have any? Kindly permit me know in order that I may just subscribe. Thanks.